A drive south from Austin on a hot summer weekend takes road tripper Aaron Reed on a journey home to Rockport and Port Aransas, on the Gulf coast of Texas. Here he paddles his kayak, eats grilled shrimp and tuna tacos, and has a chance encounter with a giant blue land crab. It's one of the reasons he loves this place so well -- there's no telling what will show up. Tamara's all-wheel-drive Subaru Baja is a workhorse and still gets great gas mileage with two 16-foot kayaks strapped to the roof racks. 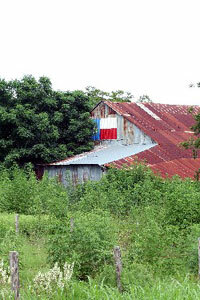 Texas pride is evident everywhere -- including old barns like this one, north of Cuero on Highway 183. A South Texas sunset turns the water into a molten rainbow. It's got to be the easiest "long" drive in Texas: south from Austin on U.S. Highway 183. Lockhart, Luling, Gonzales, Cuero, Goliad, Tivoli … to Rockport. I've done it so often, it's almost as if my truck is on rails. One of the reasons I enjoy U.S. 183 so much is that it's not a very modern road, not efficient in the Point-A-to-Point-B way our interstates are. In fact, for much of its length in this part of the state it follows the old stage route from Indianola to San Antonio, winding and dipping, crossing rivers and creeks at natural fords. If the verdant roadside landscape and gentle hills aren't distraction enough, there are the Victorian courthouse squares along the way. Every one of those towns -- with the exception of Tivoli -- has one. On July 4 weekend, Tamara and I headed south -- me to do some coastal paddling, she to enjoy a well-earned rest from a hectic work schedule, and both of us looking for the "quality time" we sometimes miss during the busy work week. Our chariot for this trip: Tamara's plucky, all-wheel-drive Subaru Baja, the tiny truck bed loaded with gear and two touring hulls lashed to the roof racks. Highway 183 always means a trip home for me, but it's also a trip into history. The first shots of the Texas Revolution were fired near Gonzales, and in Goliad we pass Mission Nuestra Señora del Espíritu Santo de Zúñiga on the right (now a state park) and Presidio la Bahia, established in 1749, on the left. The capilla, or chapel (Our Lady of Loreto), has been in continuous use as a church since about the time of the signing of the U.S. Declaration of Independence. I tip my cap as we drive past. It was at Goliad that the Mexican Army, on the orders of Gen. Antonio López de Santa Anna, massacred 342 captured Texas soldiers on Palm Sunday in 1836. A monument marks their gravesite. Here too, some seven years before the Goliad massacre, Ignacio Seguín Zaragoza was born. Zaragoza would go on to lead the Army of the East to victory over French forces at the Battle of Puebla, Mexico, on May 5, 1862. Cinco de Mayo, a national holiday in Mexico, is still celebrated here. Tam and I make a note to come back and reserve the single room available to travelers inside the presidio's stone walls. Just past the presidio, it's a left on state Highway 239, a half-hour drive along the San Antonio River Valley and through the pastures and grain fields of O'Connor Ranch to Tivoli. Right on state Highway 35, a flat, straight reach through cotton fields and rust-red acres of sorghum. To the right, near a rest stop, stands a sabal palm, remnant of one of just three native species of palm that once flourished here. Farther ahead, to the left, is Aransas National Wildlife Refuge, winter home to most of the world's population of whooping cranes. We cross the causeway at Lamar Point, and without thinking I mutter a prayer under my breath: "Thank you for letting me come home again."